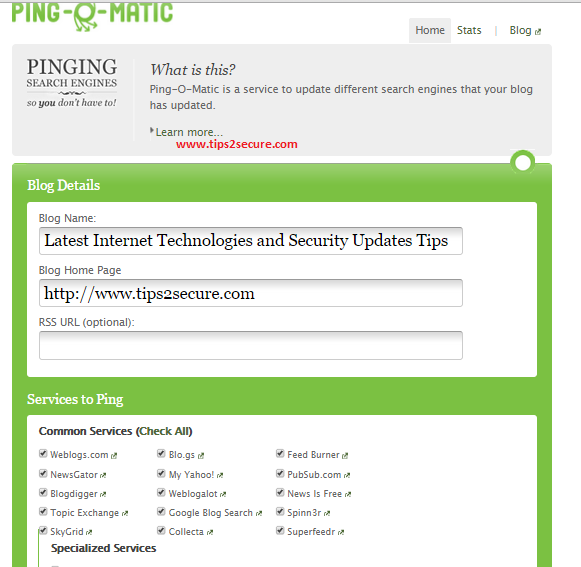 Ping-O-Matic is a online service that lets you send ping and submit your blogs on dfferent search engines including Technorati, Feed burner, feedster, blogdigger, blogrolling etc. Pingomatic is a very simple way to bring traffic on your blogs. Its very simple to use. When you submit your blog on pingomatic it autimatically send pings to search engines and submit your blog posts in search engines. 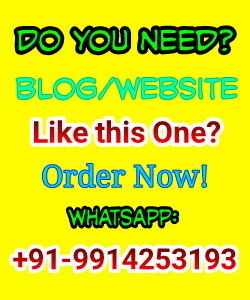 If you are a newbie and dont own any website or blog to drive traffic, then don't worry use Create Your Blog and Websites for Free by using Blogger.com or wordpress. It will guide you how and which services can be used to create blogs like Tips2secure. All these services are free. Open Pingomatic , it opens a page like shown in image. First of all put your blog title, then copy and paste your blog in url option in Pingomatic. Below this you will find a list of search engines, select all at a single time by clicking on select all check box. Then click on send Pings. You have done. Pingomatic is specially designed for those peoples who wants to drive traffic on their websites and blogs but don't have any knowledge about SEO (Search Engine Optimization), or dont know more about Meta Tags. To drive traffic on any website or blog one needs to submit their blogs/websites through webmaster tools or manually in search engines. but Pingomatic automatically submit your websites and blogs in search engines. When search engines receives your blog url then bots of search engines visit your url and indexed your site/blog in their lists and start giving traffic on your websites/blogs when peoples make relevant search related with your blogs or articles. Replace www.yoursite.com with url of your own site or blog. For pure surity after creating your blog check this before submiting in Pingomatic.com and then again check after 48 hours of submission. If you feel any type of problem, difficulty, complexities or confusion then let me know to help you via comment box. You can also reach us on Our Facebook Official Page. Do this website really drives traffic to your site? I'm not sure at all. But I think it helps indexing your site faster. I still use and love this tool.